Located at the world-famous Santa Anita Racetrack (Figures 16.46 and 16.47), the Santa Anita Assembly Center was the longest occupied assembly center, used for 215 days, from March 27 to October 27. It was also the largest assembly center, housing a total of 19,348 persons from Los Angeles, San Diego, and Santa Clara counties, with a maximum at one time of 18,719. Those interned lived in hastily constructed barracks and in existing stables, with 8,500 in converted horse stalls (Figures 16.48 and 16.49). Figure 16.46. Santa Anita Assembly Center. Figure 16.47. Construction underway at the Santa Anita Assembly Center. The assembly center was divided into seven districts: District 1 had 21 stable buildings converted into barracks, District 2 had 20 stable building, District 3 had 19 stable buildings, District 4 had four stable buildings and 113 freshly-built military barracks, District 5 had 161 barracks, District 6 had 160 barracks, and District 7 had 155 barracks (Lehman 1970). Bachelors were housed in the grandstand building. There were six recreation buildings, six showers, six mess halls (referred to by color; Blue, Red, Green, White, Orange, Yellow), a hospital, and a laundry (Figure 16.50; Santa Anita Pacemaker various issues 1942). 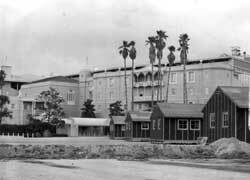 There was a large warehouse and an automobile storage yard in the racetrack infield and the grandstand seating area was used for a camouflage net factory which employed the Japanese Americans. Figure 16.50. 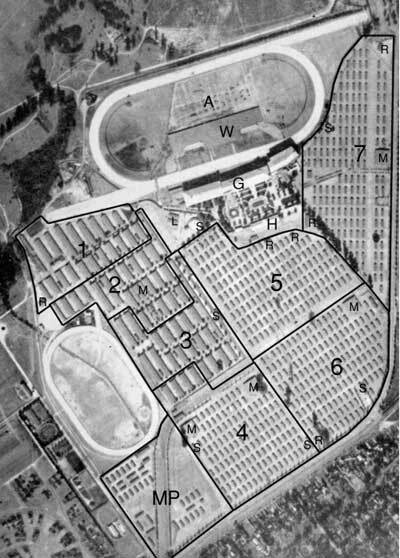 1942 aerial photograph of the Santa Anita Assembly Center; A - automobile storage, G - grandstand (housing), H - hospital, L - laundry, M - mess hall, MP - military police and administration area, R - recreation building, S - showers, W - warehouse, 1-6 - barracks districts. There is no historical marker at the site. The areas where the assembly center barracks had been (Districts 4-7) are now paved parking lots, and the District 3 and 4 stables and the military police compound are now a large shopping mall (Santa Anita Fashion Park). 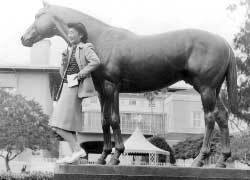 However, the massive grandstand and other racetrack buildings present in the 1940s remain (Figures 16.51 and 16.52), as do the horse stalls of Districts 1 and 2. The stables, of wood, are the same as in aerial and historical photographs (Figures 16.53 and 16.54). Security personnel at the stables mentioned that Japanese Americans occasionally return to see their former homes. There are presently as many people (stable workers and their families) as horses living in the stall area.